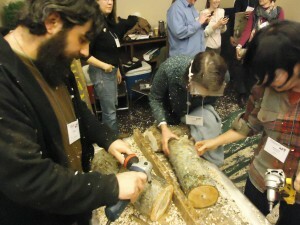 Saratoga Springs, NY — Farmer interest in the practice of log-grown shiitake mushrooms is growing, as evidenced by recent conversations at the 2013 Winter NOFA – NY Conference held last week. On Thursday, members from a team of researchers and famers from Cornell University, the University of Vermont, Chatham University, and farms scattered thought the Northeast US met in the day preceding the conference to discuss results of a NE-SARE funded proposal “Cultivation of Shiitake Mushrooms as an Agroforestry Crop for New England.” A summary of results can be viewed on the video, below, given by Allen Matthews. Project summary papers can also be found by visiting the grant website. In addition to reflecting on lessons learned, farmers and researchers discussed their experiences which are being compiled in a “best management practices” handbook for growers, expected to be released at the Northeast Forest Mushroom Growers Network website later this year. As with any new niche crop, there are many lessons to be learned and the network aims to collect information about new growers and facilitate cooperative exchange of information and ideas through its website, which includes a grower directory and discussion listserv. Many of the participants stuck around the conference for Friday, where an introduction to forest grown mushrooms was presented. Over 50 conference attendees registered for the class and numbers swelled to well over 80 people during the three hour workshop, where presentation was paired with the opportunity for hands-on inoculation of shiitake logs. From the buzz in the room it was clear this agroforestry practice is on the rise in the Northeastern US. View the video above to learn more about the basics of mushroom cultivation. Those further interested in forest mushroom cultivation are encouraged to visit our events page for inoculation workshops offered during the coming growing season. The site also contains several fact sheets and growing guides to you started, along with information on the ongoing research happening at Cornell and elsewhere.